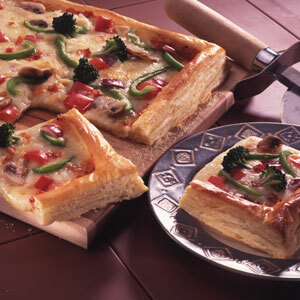 This large rectangular pizza, topped with broccoli, mushrooms, peppers and cheese, is perfect for last-minute snacks. And since it's made with a puff pastry crust, it's perfect for entertaining too. Unfold the pastry sheet on a lightly floured surface. Roll the pastry sheet into a 15x10-inch rectangle and place onto a baking sheet. Fold over the edges 1/2 inch on all sides, pressing firmly to form a rim. Prick the center of the pastry thoroughly with a fork. Bake for 10 minutes or until the pastry is golden brown. Heat the oil in a 10-inch skillet over medium heat. Add the broccoli, mushrooms, pepper and onion and cook until they're tender, stirring occasionally. Spread the sauce on the pastry. Top with the vegetable mixture. Sprinkle with the cheese. Recipe Note: This recipe serves 16 as an appetizer. Flavor Variation: Add any of your favorite pizza toppers: pepperoni, sliced pitted olives or cooked crumbled sausage.